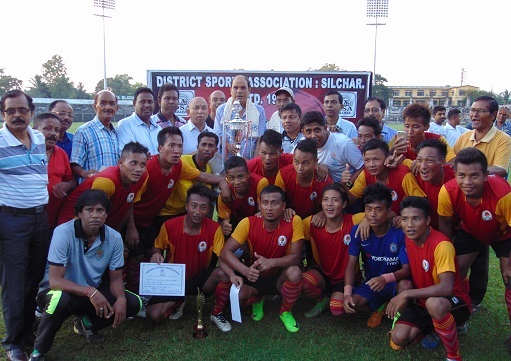 Town Club of Silchar, lifted the prestigious Mridul Hore Prize Money football trophy defeating Tarapur Athletic Club by a margin of 2-1, played at Silchar District Sports Association ground, Saturday evening. The match was evenly fought for the whole of 90 minutes. The finals played on Saturday saw Town Club scoring the first goal at the stroke of 29th minute into the first half by Lalhmingchhuanga which was later equalized by Tarapur AC at the beginning of the second half at 55 minutes by Titas Rongmei. But, the decider at 78 minute by Town Club’s Lal Buatsaiha, sealed the spot for them to lift the cup. Former Assam sports minister Ajit Singh gave away the prizes with the winners pocketing Rs 5,000, while the runners Tarapur AC took home Rs 3000.